This week I have determined that everything is better with praline on top. What is praline? The dictionary says a confection made with nuts and sugar. Most often, it's brown sugar and pecans. If you hit up gas stations in the southern part of the US, you may run across them right by the checkout lane. I made praline candies when I lived in Indianapolis. Successfully. When I moved to Colorado, I managed to ruin them twice due to the altitude and my candy thermometer my first year. After wasting money in pecans and heavy cream, I decided that pralines were no longer on my Christmas candy list. Back at sea level, I'm willing to go at it again. And why limit my praline-ing to just brownies? 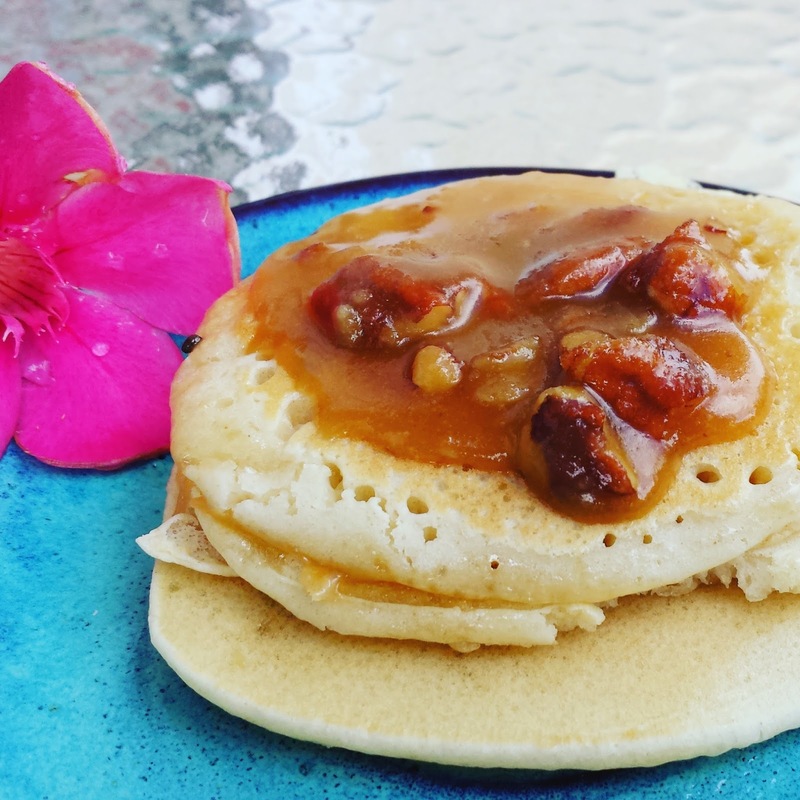 Don't pancakes deserve the pecan, butter, cream and sugar confection? Sometimes, I just confection myself by eating it straight out of the bowl. Sugar really does melt in your mouth. So if you want to praline things....here's what you need to know. In a medium sauce pan, combine the butter, whipping cream, brown sugar and salt over medium heat. Bring to a boil and boil for one minute. Stir frequently. Remove from heat, add the vanilla and powdered sugar, and whisk until smooth. Stir in pecans. Let the sugary goodness sit for five minutes. The sugar on the top might harden a little, but not to worry. Pour the praline mixture over the treats of your choice - brownies, cookies, pancakes, etc. Praline brownies were devoured in record time at my office this week. Make your favorite brownie recipe. I used the Ghiradelli dark chocolate brownie mix and made a 8x8 pan of brownies. After the brownies cool completely, make the praline topping and pour over the top. The topping makes plenty, so you can have a thick layer of praline, or reserve some for other things. Like pancakes. Or eating with a spoon. I was completely inspired to praline things after reading this recipe over on Cookies and Cups. Check it out! When was the last time you had a praline?